3 Beds 3 Baths 2,740 Sq. 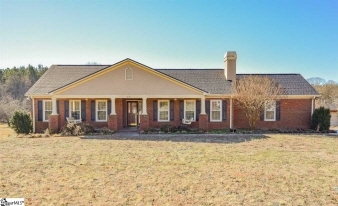 ft.
Full-brick single level home that offers over 2700 square feet, 11.6 acres, a detached single car garage, a barn, and so much more! This home and property have so much to offer - there are 2 bedrooms and 2 full baths on one side of the home and another bedroom, full bathroom, 2nd kitchen area, and 2nd living room on the in-law side of the home. Easy access to Hwy 25 and the Southern Connector. This property was recently appraised for $340,000, and has been listed below market value. The property is in an Estate and will be sold as-is...see it soon before its gone!